This month, my book club has designated Charlotte Bronte's classic work, Jane Eyre, as the book of choice for its face to face discussion. I am almost halfway through it at 48% and I am enjoying every bit of the story so far, except for one teeny, weeny bit: that part about the mysterious demonic laughter and odd sounds that Jane hears from the third storey of Thornfield Hall, from the room directly above hers, which every inhabitant attributes to be made by one of the older servants named Grace Poole? Well. The mystery hasn't been revealed yet from my place at 48%, but I have a pretty good idea what it's all about. All thanks to Jasper Fforde's The Eyre Affair, the first in his Thursday Next Series which I read last year. Welcome to a surreal version of Great Britain, circa 1985, where time travel is routine, cloning is a reality (dodos are the resurrected pet of choice), and literature is taken very, very seriously. England is a virtual police state where an aunt can get lost (literally) in a Wordsworth poem, militant Baconians heckle performances of Hamlet, and forging Byronic verse is a punishable offense. All this is business as usual for Thursday Next, renowned Special Operative in literary detection, until someone begins kidnapping characters from works of literature. When Jane Eyre is plucked from the pages of Brontë's novel, Thursday must track down the villain and enter the novel herself to avert a heinous act of literary homicide. Essentially, therefore, the plot of The Eyre Affair, as evident from its title, is somehow built around the story of Jane Eyre herself. Unwittingly, too, crucial parts of this wonderfully written classic were divulged in order to construct the part of The Eyre Affair where its protagonist, Thursday Next, literally "enters" the pages of Jane Eyre. Take a look at the following text from the photo of my copy. If you can afford a bit of a spoiler, that is. I purposely took a blurred picture. Yes I did. Which beautifully ruined my reading of Jane Eyre, presently. 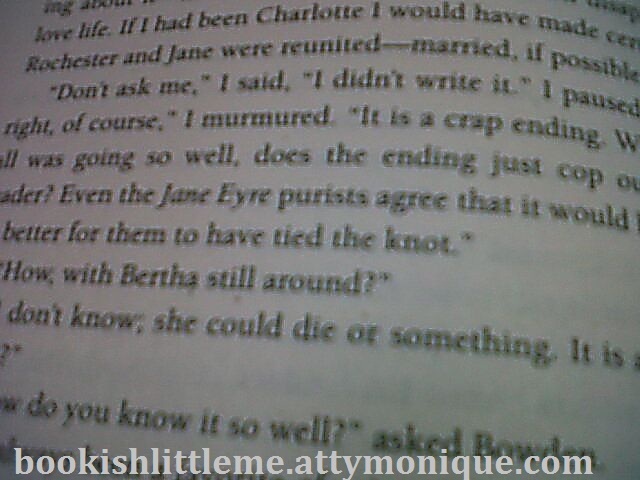 Which I didn't realize would happen when I read The Eyre Affair. It feels like I'm merely skimming through reading the chapters of Jane Eyre in order to get to that part that I already know. And it kills me, too, because I'm loving the book so far, and it would have been a more enjoyable experience had I not known beforehand about certain parts of the plot. Oh well. I can't un-know what I already know now, right? But I learned my lesson well: I will be more careful and circumspect in reading books that have reference to other books next time! TINA: I just get annoyed sometimes, because if I hadn't known about THAT part of the story, it would be a lot more fun reading Jane Eyre. Hello, Monique. 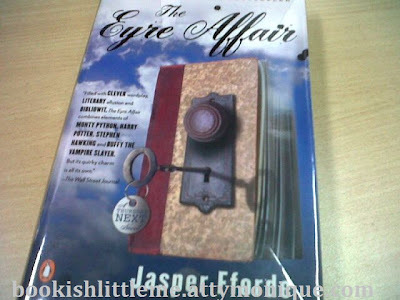 I think I'm one of the few who didn't like The Eyre Affair. A couple of my book club friends mentioned that the series gets better along the way. Still, I'm wary. Hehehe. Hi Peter! From what I reckon, Fforde's works aren't for everybody. 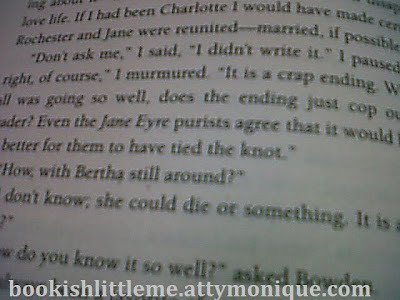 The Eyre Affair was okay for me, though it wasn't really that exceptional.